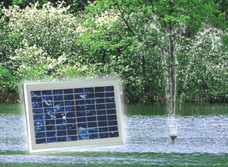 Enjoy the sound of water fountain from our eye-catching superman solar pump kit that is powered by direct sunlight gathered in the solar panel. * It can be set up easily wherever desired without the need for batteries or wiring installation. * Perfect for creating a new fountain, waterfall anywhere in the pond, yard or patio. * Fountain height up to 40 inches / 1m, water flow capacity: 105g/h (450l/h). * Includes a 6W solar panel and a 12V solar DC pump. * Includes 3 different fountain heads for different fountain shapes. * The solar pump has an extra-long cord that allows the solar panel to be placed up to 15 feet / 5m from the fountain. * Replace your present electric power with this solar pump kit to make your fountain more environment-friendly, more portable and safer for your kids. specifications︰ Enjoy the sound of water fountain from our eye-catching superman solar pump kit that is powered by direct sunlight gathered in the solar panel.